If cafe-style treats and a hot cup o’ joe are your “thing, ” stick around. 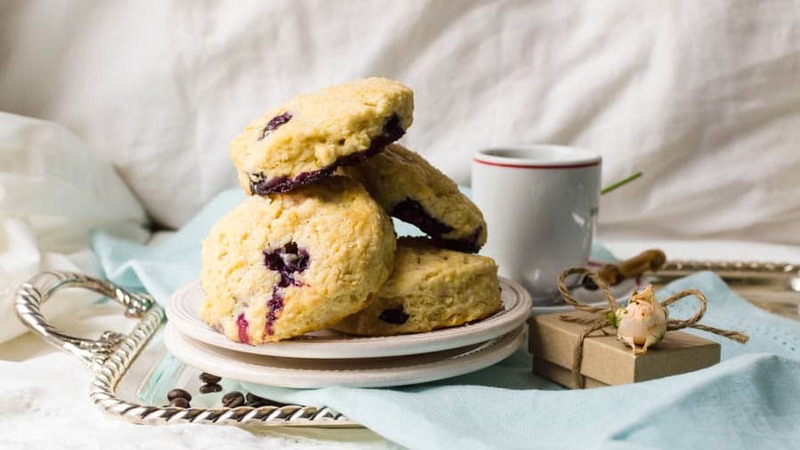 These homemade scones are light and flaky, filled with fruit and are the ideal pairing for good cup of coffee. 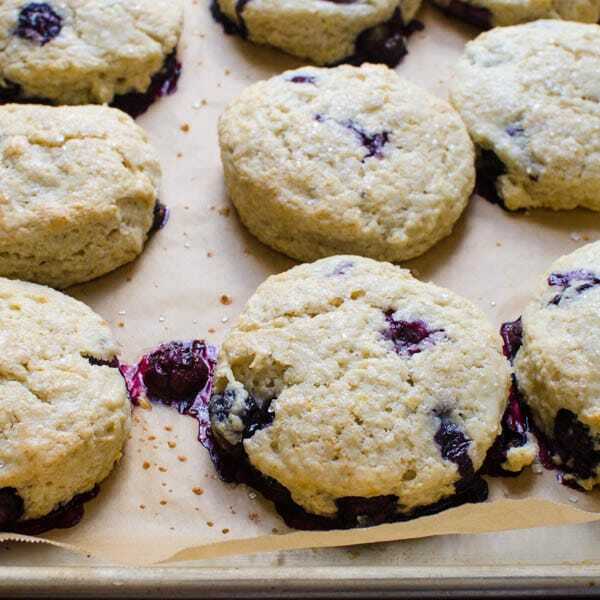 Cafe-Style Blueberry Cream Cheese Scones are perfect, right from the oven. Take a good look. This is my Mother’s Day fantasy. It’s simple. Breakfast in bed. 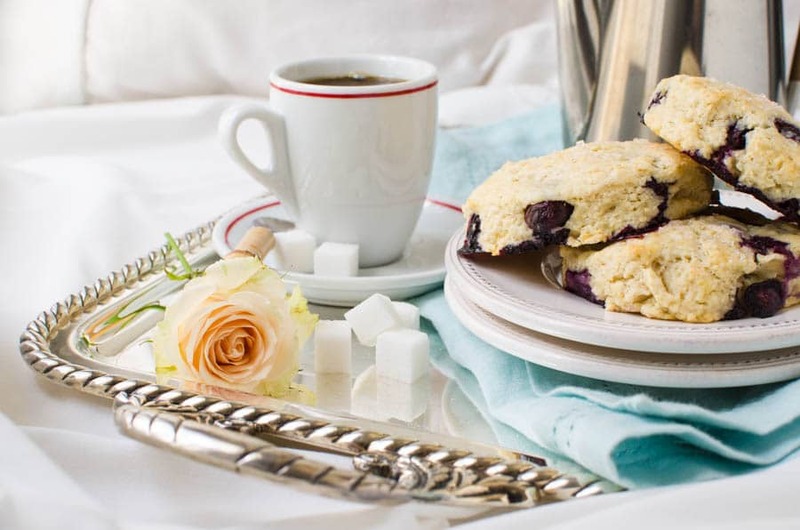 With homemade scones, fresh-brewed coffee, a silver tray and a bud vase of flowers. It’s never happened before, but I’m hopeful. And since I’m actually writing an entire post about it — and giving plenty of advance notice (cough), I think my odds (and maybe yours) are better than average. 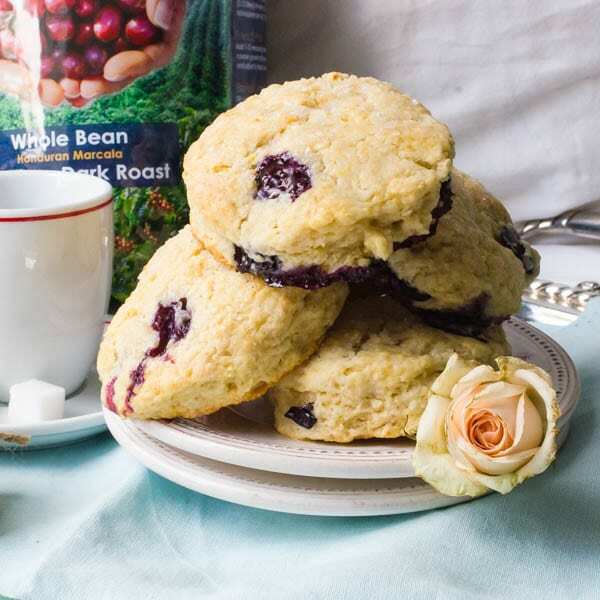 Fair warning: You may not want to wait until Mother’s Day for these Cafe-Style Blueberry Cream Cheese Scones. To my husband and daughter, consider this a road-map for what Mom wants for Mother’s Day. It starts with breakfast in bed and a good, hot, fresh cup of coffee (with unlimited refills). The coffee is absolutely essential and my favorites come from Cafe Don Pablo. Why Don Pablo and Subtle Earth Organic? I’ve been buying Don Pablo Signature and Subtle Earth Organic coffee at our local Costco for years — ever since we sampled it during one of those Roadshow events. Friendly representatives from the company were at our store in Boca Raton one Saturday morning, greeting the shoppers with a vibrant display table and carafes of steaming coffee. It was festive and fun and I had to try it. (I love samples). This coffee was so rich, deep and smooth with no bitter aftertaste, so I took a bag home. The next time we were out of coffee, Scott adamantly requested that I buy “the good stuff” again. Don Pablo. Which is why I am so thrilled to partner with them now and to introduce you to a truly great cup of coffee – as well as a very cool back story. 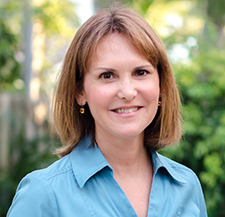 Owner and founder, Darron Burke moved to South Florida the same year that I did — 1989. He was looking for adventure — and got one when he met the lady who would become his wife, Eliana. Eliana’s family lives in Colombia and when he went to meet them, he discovered a place and people that captivated his spirit as well as some of the finest coffee in the world. He and Eliana saw an opportunity to introduce this coffee to the folks back home and that’s how things got started. I love that story because it’s so real. It puts a human face on the brand. 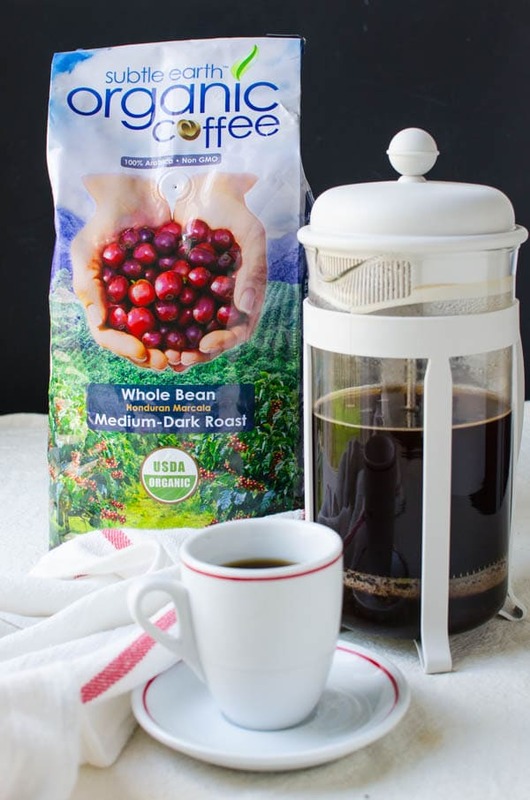 Their entrepreneurial spirit led them to Costco and Amazon where sales of Don Pablo Signature Blend, Subtle Earth Organic Coffee and a myriad of other specialty blends have exploded. Good for them! Good for you is that they’re offering Garlic & Zest readers a cool 20% off when you order through their Amazon store and use the checkout code MOM! Pick your favorite blend and save a few pesos! How Did They Get The Name, Don Pablo? I think this is my favorite anecdote, the name Don Pablo came from Eliana’s grandmother, who as a native Spanish speaker, struggled with pronouncing “Darron”. I can just picture her trilling her “r’s,” being frustrated with the linguistics, throwing her hands up and shaking her head. Perhaps out of sheer frustration, she gave him the nickname, Don Pablo and it stuck. Now about my Mother’s Day fantasy. 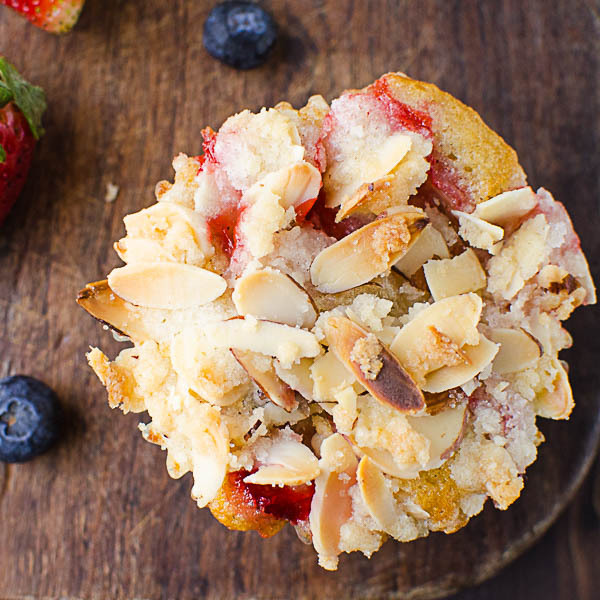 Coffee – A MUST — and something hot and fresh baked — preferably with butter and oozy fruit. My first inclination is scones. I love these peach praline scones, but it’s not peach season yet, so how about Blueberry Cream Cheese Scones. Flaky, rich, slightly sweet with jammy blueberries and a crunchy sparkling sugar crust. Doesn’t that sound good? Now since this is my fantasy — I figure I shouldn’t have to make ’em myself, so I’m gonna give my husband and daughter (and maybe yours) a few pointers on how to get the best results. Make sure the butter and cream cheese are COLD. If they’re soft or at room temperature, you’re more likely to “cream” them into the flour rather than cut. Cut the butter and cream cheese into smaller chunks and refrigerate them until you’re ready to cut them into the mixture — this, starts the cutting process before you even add them to the flour (more on that later). Add the butter and cream cheese to the flour mixture at the same time, to prevent over mixing and so that they are distributed evenly. When the dough “just comes together” but there’s still some shaggy pieces in the bowl, turn it out onto a lightly floured work surface and quickly fold and pat it into a rectangle, but don’t overwork the dough. Your hands are warm (unless you’re a vampire) and that heat can soften and melt the butter in the dough before it has a chance to steam and rise in the oven. Since it’s the steam that’s responsible for creating layers, the less kneading and folding you do, the better. 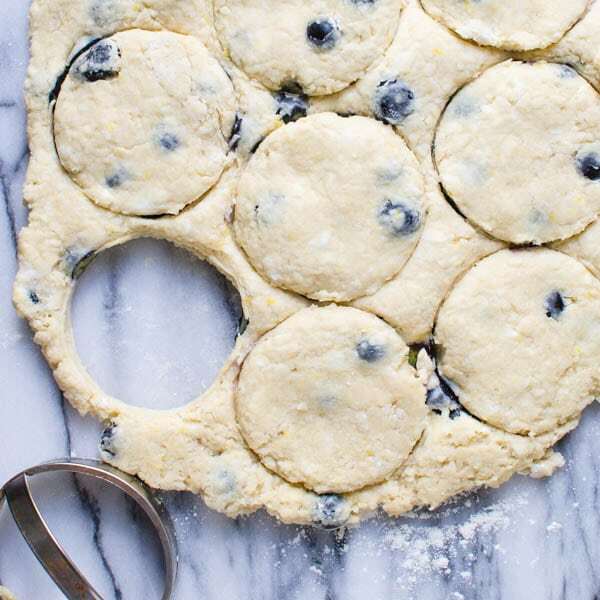 Pat the dough into a 3/4″ thick rectangle and use a biscuit cutter to form the scones. DON’T TWIST THE CUTTER. Twisting can seal the rim of the dough making it less likely to rise. Press firmly down with the cutter and lift it up. Sometimes the scone will lift out with the cut, other times it won’t. If it doesn’t, just carefully pry it up with your fingers and set it on a baking sheet. Better to be safe than sorry — line your baking sheet with a silpat or parchment paper for easy release(and cleanup). 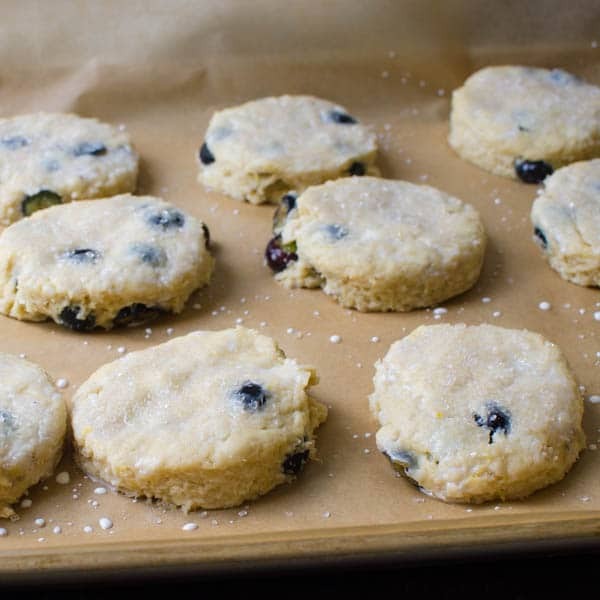 Last but not least — make sure your oven is preheated and pay attention to the directions — for these scones, they bake with the oven ON for 8 minutes, then the oven is TURNED OFF for the last 8-10. The directions read: Cut the butter and shortening into the dry ingredients until it resembles coarse cornmeal. If you’ve done this before and your a pro, move on to the recipe. But if you have no idea what I’m talking about, stick around. Use a Food Processor – ok, this is the easiest method and it only takes about 10-15 pulses before the shortening bases are small and pea like, but you need to be careful not to over-process — because even though the cream cheese is cold, it’s still much softer that the hard butter and you don’t want to pulse this into a solid dough. Use a Pastry Cutter – I’ve had my pastry cutter for years and love it because it’s quick and efficient, though it does take a little elbow grease. The genius of this little gadget are the wire-thin individual blades (5 of them on mine) which easily cut through hard butter and cold cream cheese, while keeping your warm hands out of the mix. Critical for flaky pastry. Use Two Sharp Knives – You can literally CUT butter (and creamed cheese — even shortening) into flour with two sharp knives. I’ve done this. Hold the knives (one in each hand) with your index finger on the bolster and spine and the heels of the knives facing out towards the sides of the bowl and glide the knives against each other and through the butter and flour, almost like a pair of scissors. Continue until you’ve cut all of the shortening ingredients into tiny pebble sized pieces and they’re evenly incorporated with the flour mixture. I mentioned before that these homemade scones bake for 8 minutes with the oven on — then the oven is turned off — and the scones continue to bake from the residual heat. The scones should take on a very slight golden color. Just look at how the fruit bursts and leaks around these Blueberry Cream Cheese Scones. Now that’s a sight to behold. Mother’s Day aside, Blueberry Cream Cheese Scones would be a welcome treat for any afternoon snack, weekend brunch or holiday get together, so don’t be constrained by my laser focus on May 13, 2018 (cough-again). These Cafe-Style Blueberry Cream Cheese scones are easier than you think to make — just watch the video! It’s less than a minute. 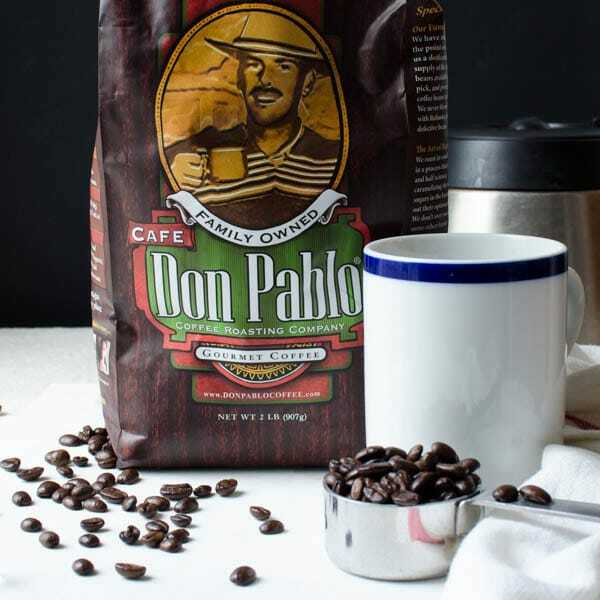 And don’t forget to use the special discount code (available only through Garlic & Zest) MOM for 20% off when you’re ordering your own special blend from Don Pablo! 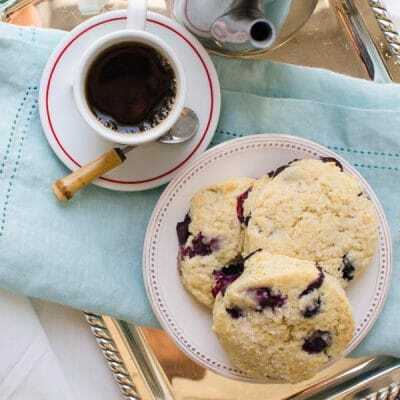 A real treat for your next brunch or special occasion, these buttery scones with pops of blueberries and subtle tang are best served warm with softened butter and your favorite jam or curd. This recipe is adapted from The King Arthur Flour Baker's Companion Cookbook. Preheat the oven to 425°. Prepare a large baking sheet with parchment paper and set aside. In a large bowl, whisk together the flour, cornstarch, sugar, baking powder and salt. Cut the cream cheese and butter into the flour mixture with a pastry cutter (my preferred method) or a fork or mixer, until it resembles coarse cornmeal. 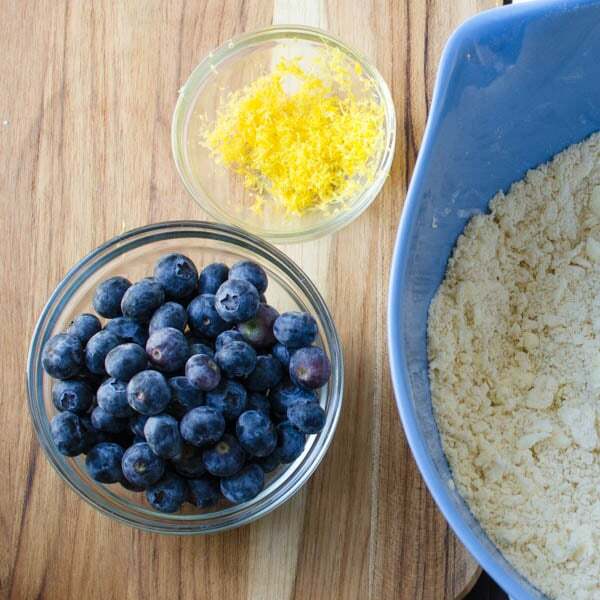 Stir in the lemon zest and blueberries and toss to combine. Set aside. 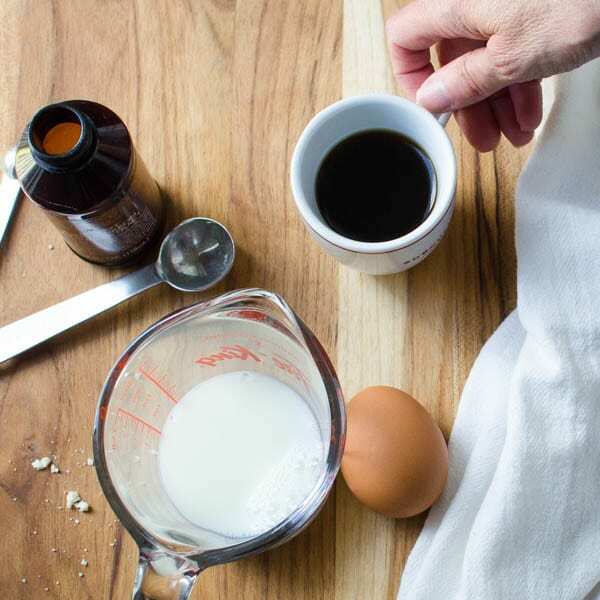 In a small bowl combine the egg, vanilla and milk and whisk together. Pour the wet ingredients into he dry ingredients and stir until the dough just starts to hold together. (Don't overmix or the scones will be tough). Sprinkle a work surface with flour and turn the shaggy dough out onto the surface. Fold it over several times until it holds together. Pat the dough into a 3/4" rectangle. Cut the scones with a round biscuit cutter (mine is about 3" in diameter). Gather up the scraps and pat into another rectangle, and cut out the rest of the scones. Transfer the scones to the prepared baking sheet about 2" apart. Brush the tops of the scones with milk and sprinkle with sugar. Bake the scones for 8 minutes. TURN OFF THE OVEN and let the scones continue to bake for 8 minutes or until lightly browned. Serve hot with softened butter and your favorite jam or curd. A glaze is always a good — glad you enjoyed them! These are amazing! We replaced one cup of flour with almond flour, omitted the lemons zest as I didn’t have any, wrapped the scone dough around a Tbps of blueberries instead of folding them in, & sprinkled the top with culinary lavender flowers. Amazing treat!! The cream cheese is the key ingredient I think. Thanks for sharing. I’m so glad you liked them, and applaud your creativity! Where did you find culinary lavender flowers? I wondered if the liquid amount is correct. I needed to add another egg and much mor milk…1/4 cup doesn’t seem to be enough. Yes, it’s correct — very little amount of liquid — take a look at the video — you’ll see that the amount of liquid looks minuscule compared to the dough. The key is to bring the liquid and the dough together until it’s just cohesive (don’t over-mix). Your article is super helpful, I have been intimidated by scones but I do love to eat them! Saved this, going to make these soon. Thank you so much for the step-by-step hints. When reading a recipe it’s hard to know exactly why we are doing the steps a certain way and it’s impossible to learn. Your information on methods is super helpful to the learning process. Thanks so much! I have never used cream cheese in scones before but I am so intrigued and quite frankly excited. I can’t wait to try it the very next time I make scones. I love the combination of blueberry and lemon, it’s one of my favorites, and those blueberries are bursting with flavor! And the addition of demerara sugar on the top is perfection! Having enjoyed these scones, I feel the pressure (nudge) for Mother’s Day. I need to get Emily home from college to help!!! I certainly hope you get your wish!! I know I won’t! I just could stay in bed while someone else is fiddling around in my kitchen. Now, we do love our coffee and are always looking for a good blend. Can’t wait to give this a try!! And I’m a regular at Costco and Amazon sends out an APB if I don’t place an order several times a week. Not every reader can say, “I tried these scones. No, seriously this exact batch of scones you see in these pictures” They’re exactly what you would expect. 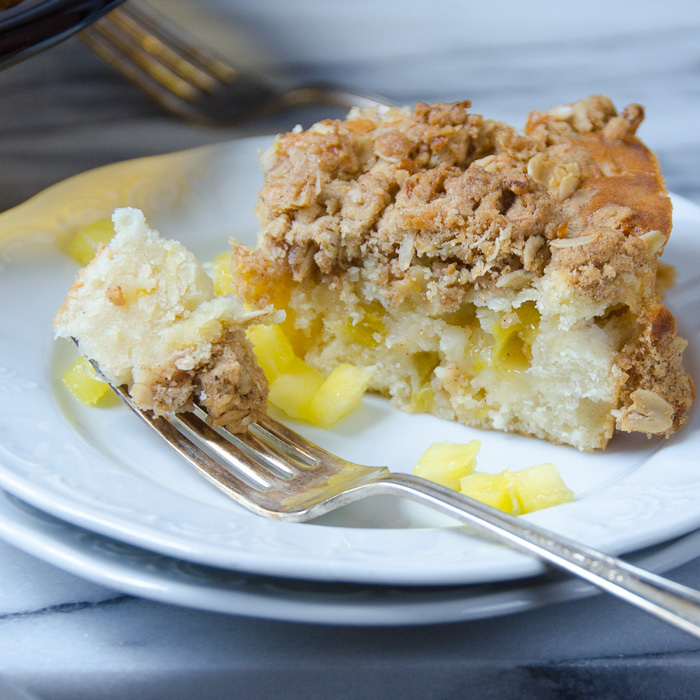 Not to sweet, oozy tart fruit, and crumbly. I feel so lucky to have met you and have enjoyed some quality coffee time and these Blueberry scones with you. I am a native Colombian, so I am VERY picky about my coffee. Reading Don Pablo’s story makes my heart sing. Thanks for sharing it with us! Thank you so much Flavia! It was a pleasure getting to know you and I’m so happy you enjoyed these scones… Don Pablo’s coffee blends are worth seeking out! Kathy, Don Pablo has an online store and if you use the discount code MOM you’ll get a 20% discount! These are so delicious looking!! I have to make them. Looks absolutely delicious! I can’t wait to try this recipe!! I’m so glad you like them, Claudia! Please let me know when you do. I’d love to hear your thoughts! Ah, yes, well that’s the limitations of technology, right? Can you believe I have never make scones at home :/ Need to change that ASAP, coz now I have the perfect recipe with the fruit I love the most! The cream cheese makes these scones so tender — and this is definitely the best coffee I’ve ever had. It’s smooth and deep, but no bitter aftertaste. 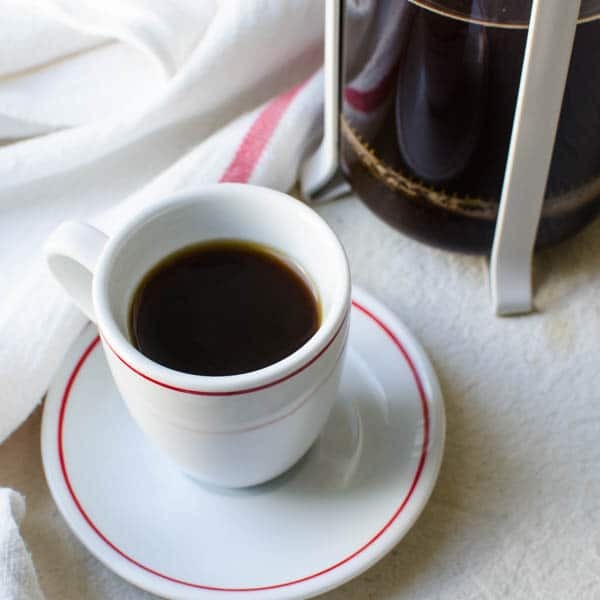 I’ve made it in a percolator pot as well as a French Press… both delish! Those scones and that coffee look like the perfect pairing! I know what I’m asking for for father’s day! LOL! Thank you, James. I hope you get them both for Father’s Day. These scones look amazing! I doubt anyone in this house will make them for me, so I’ll have to make them myself! Thanks for the video – makes it look easy! And I’ll definitely buy some Don Pablo coffee for the 3 coffee drinkers in the house. I LOVE their story and my family loves a great cup of coffee!!! Jill, I’m so glad you like it – these scones really are easy to make — if you have to do them yourself — the coffee is really the best I’ve had. We drink it every morning. I truly hope you get your coffee and scones in bed on Mothers Day morning. I just might forward this post to my husband and hope that he gets the hint too. I will only drink organic coffee and this looks divine. A fresh scone with a hot cup of coffee is literally my happy place. I love berry scones too and I be the cream cheese gives them amazing flavor. These look wonderful. Well all I can say is…if someone makes me scones and coffee for ANY day of the week I would be a happy girl. We do love our coffee, and like trying MANY different brands. I am in Canada and will have to see if I can find this in the stores here. You can never go wrong with a GREAT cup of coffee. Don Pablo has an online shop through Amazon, that’s probably the easiest way — and you can take advantage of that discount! I’ve never heard of Don Pablo coffee but will definitely have to pick some up… you know how much James loves his coffee! The scones look amazing too! Breakfast perfection! I get my Don Pablo at Costco. Scott and I drink a whole pot every morning… and those scones are dynamite with it. My perfect morning would be to pair these two, sit outside on the patio and just enjoy the morning. That is idyllic! Especially if someone else is making them for you! My all time favorite “bread.” Do I have to wait for Mother’s Day? Am definitely going to try Don Pablo! Love their story. Do not feel obliged to wait until Mother’s Day, if the need arises sooner! I LOVE Don Pablo and I’m heading to the store to get Ingredients! In-laws in town this weekend so I want To impress them! So far, you haven’t steered me wrong! I ‘ll let you know how everything goes! Thanks so much, Christi! I hope they enjoy it. Take advantage of the discount for the coffee too! I’ll be sharing this recipe with my husband along with a big *nudge* to plan breakfast in bed for Mother’s Day. Fingers crossed! Ha! I’m crossing everything for you, Allison! this recipe looks so delicious! i can totally picture myself lazing on a weekend drinking coffee and eating scones!! yum! I have the same image! I’ve never made scones! I definitely need to show this to my husband. I think some mother’s day pampering is in order. Wow these look so good, and super simple! Perfect pairing with some good coffee! Thank you, Emily! You’re right, they are perfect with a hot cup of coffee! That’s very kind of you, Chris! The scones are simple to make and they go down — WAY TOO EASILY!